There’s a small Restaurant in Chennai known as “Safari” and their Fish Biryani is simply superb. The fish is tender and spicy. It is definitely not fried in oil; probably steamed with rice and masalas. Their fish biriyani doesn’t have lot of masalas unlike the other Biriyanis but it simply tastes excellent. They also include curry leaves and coconut milk which impart a fine taste to the Biriyani. 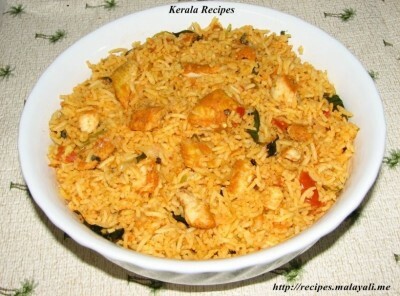 Ever since, I have tried different recipes for Fish Biriyani but none have got close to the Safari Fish Biriyani. Later on, I read about boiling fish instead of frying it in oil. I tried this method and it was good though it is nothing compared to Safari’s Fish Biriyani. So here goes my recipe for a Simple and Tasty Fish Biriyani made by cooking fish separately. Soak Basmathi rice in water for 30-40 minutes. Clean the fish fillets and marinate it using the ingredients mentioned above. Refrigerate it for 30 minutes. Boil the Basmati rice in at least 6-8 cups of water with a little salt, 1/2 tsp biryani masala and 1 tsp oil, till each grain is separate and almost cooked but not fully cooked. Add more water, if needed so that the rice doesn’t stick together. The biryani masala will impart a good aroma to the rice. Drain excess water if any and keep it aside. Meanwhile, transfer the marinated fish to a deep pan. Add little water so as to just cover the fish fillets. Add salt and cook for 8-10 minutes on medium flame. Drain the water completely from the cooked fish fillets and keep it aside. Heat a big non stick pan or wok and add 2-3 tablespoons of oil or ghee. Add the slit green chillies, curry leaves, bay leaves, 1 tsp ginger paste and 1 tsp garlic paste along with some salt and saute for a few minutes. Next, add the chopped tomatoes, chopped cilantro and mint leaves and mix well. Cook till the tomatoes are pulpy and mashed. Now add 1 tsp of biriyani masala powder, 1 tbsp fish masala powder, 1 tsp kashmiri chilly powder and 1/4 tsp turmeric and saute for a minute. Add 1 cup of thick coconut milk and mix well. Allow it to simmer for a while. Add the cooked fish fillets to the masala gravy and mix gently or better swirl the pan. If you mix too much, the fish pieces will end up getting crumbled. 🙂 Cover and cook for 4-5 minutes and keep the masala gravy aside. Heat 1 tbsp ghee in another heavy pan. Layer it with cooked rice and the fish masala alternatively. Sprinkle lemon juice. Cover with a tight lid and cook on very low flame for 10 minutes. Alternatively, if you are using an oven, preheat to 300 degree F. Cover and bake the layered rice and fish gravy for 25-30 minutes. Uncover and mix gently till the rice is evenly coated with the masala. The Fish Biriyani is ready to served hot with Raitha, Pickle & Pappadam. You have a talent for cooking… this is an easy recipe but the taste is good.